The title of “The Way” refers to the Camino de Santiago de Campostela, the 1,000-year old route from France to northern Spain that thousands of peregrinos, or pilgrims, walk each year, ending at the site where the remains of Saint James are reportedly buried. Writer-director Emilio Estevez follows four pilgrims, including dad Martin Sheen, in search of emotional meaning on El Camino de Santiago. 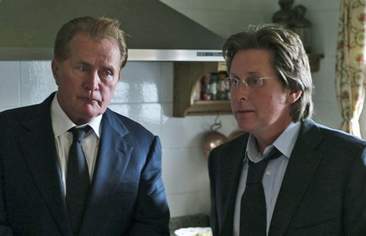 The Way, written and directed by Emilio Estevez and starring his father Martin Sheen in one of Sheen’s best performances, depicts a spiritual journey. Sheen plays Tom Avery, a California ophthalmologist and also a widower long estranged from his only son, Daniel (Estevez), a wanderer Tom rejects for his lack of focus. When Tom learns that Daniel has died in a storm in the French Pyrenees, he leaves immediately to collect the body. Instead, he collects the truth about who his son was. Daniel had just started a pilgrimage along the Camino de Santiago, an 800-mile trek from the Pyrenees to the Cathedral of Santiago de Compostela in Spain, the burial place of St. James. But as we learn, the journey can be motivated by reasons outside a search for God. Even as Tom stops along the way to spread the ashes of his son (played Estevez in flashbacks), he is stubborn non-believer. Armed with his son’s backpack and guidebook, Tom navigates the 800 km pilgrimage from the French Pyrenees, to Santiago de Compostela in the north west of Spain, but soon discovers that he will not be alone on this journey. While walking The Camino, Tom meets other pilgrims from around the world, all broken and looking for greater meaning in their lives: a Dutchman (Yorick van Wageningen) a Canadian (Deborah Kara Unger) and an Irish writer (James Nesbitt) who is suffering from a bout of “writer’s block.” From the hardship experienced along “The Way” this unlikely quartet of misfits create an everlasting bond and Tom begins to learn what it means to be a citizen of the world again, and discovers the difference between “The life we live and the life we choose”. 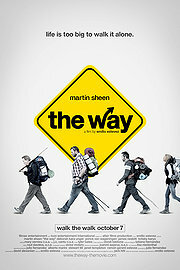 THE WAY was filmed entirely in Spain and France along the actual Camino de Santiago. Mr. Sheen plays an ophthalmologist named Tom, whose only son, Daniel (Mr. Estevez), dies in severe weather in the Pyrenees while trying to walk the Way of St. James (also known as the Camino de Santiago), a pilgrimage of hundreds of miles that ends in northwest Spain at a cathedral where the Apostle James is said to be buried. Tom goes to retrieve his son’s body and ends up walking the pilgrimage himself, scattering Daniel’s ashes along the way. The gentle drama offers an intriguing look at the contemporary version of an ancient ritual, and is anchored by the on-screen work of the writer-director’s father, Martin Sheen. At its best, “The Way” addresses the matter of privilege; among its most compelling scenes is a healthy argument about what it means to be a “true pilgrim” in the 21st century. The film is really a gift from this son to his father. Sheen, gradually revealing a man painfully getting reacquainted with long buried feelings, who gives the film its bruised heart. This is not an “inspirational film” in the usual, syrupy sense; none of these people are overtly finding God on this trek. The beauty of the movie, in fact, is that Mr. Estevez does not make explicit what any of them find, beyond friendship. He lets these four fine actors convey that true personal transformations are not announced with fanfare, but happen internally. 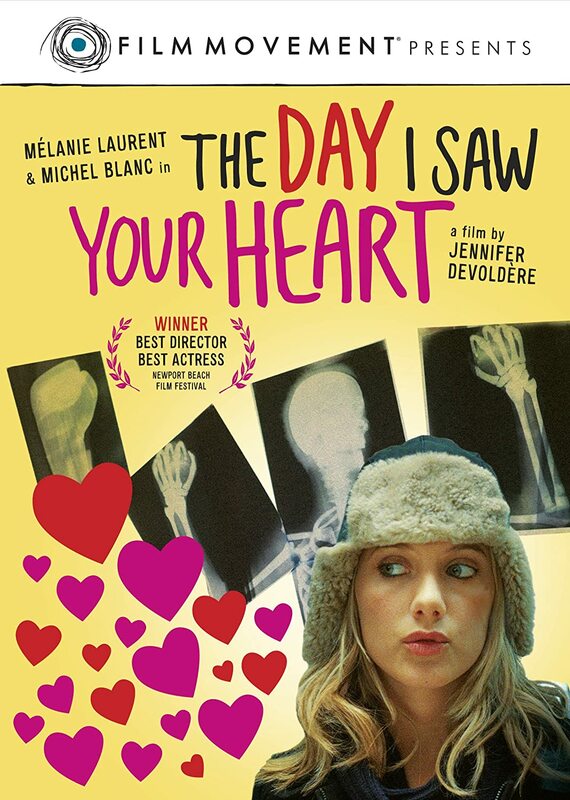 Martin Sheen gives a lovely performance as the no-nonsense doctor, and he gets wonderful support from actors playing fellow travelers who befriend Tom: Yorick van Wageningen as a verbose Dutchman, Deborah Kara Unger as an acid-tongued woman trying to quit smoking, and James Nesbitt as an Irishman with writer’s block. Yorick van Wageningen is the most convincing of the trio, playing gluttonous, gregarious and kind “Joost from Amsterdam,” as he usually introduces himself. James Nesbitt’s “Jack from Ireland,” a blocked travel writer, enters the story like a mad poet, in a bit of actorly overkill set in a scarecrow-friendly field. And as Sarah, the world’s only angry Canadian, Deborah Kara Unger portrays a character whose pain-beneath-the-swagger is evident but who’s never entirely persuasive. Emilio Estevez is both writer and director of this film, and also turns up in a small role, but he gives the spotlight to his father, who makes quite a lot out of a low-key story that could easily have degenerated into mush. THE WAY Written and directed by Emilio Estevez; director of photography, Juanmi Azpiroz; edited by Raúl Dávalos; music by Tyler Bates; art direction by Víctor Molero; costumes by Tatiana Hernández; produced by Mr. Estevez and David Alexanian; released by Producers Distribution Agency and Arc Entertainment. Running time: 1 hour 55 minutes. This film is not rated. “HABEMUS PAPAM” — Latin for “We Have a Pope,” the expression with which the election of a pontiff is announced — is a surprisingly gentle comedy about a cardinal (played by 85-year-old French actor Michel Piccoli) who suffers an attack of stage fright when he is chosen as the next pontiff. The film is an examination of the holiest of holy cows, the papacy. Moretti’s conception of the Holy Father is a man weighed down by the immensity of his burden, who must reconcile human fears with spiritual responsibilities, and who is drawn equally to the life of the world and the life of the mind. The film begins in the opulent quarters of the cardinals’ conclave as they gather and vote in secret for the one in their midst who will be the next Pope. We follow the 108 cardinals gathered together as they enter the papal conclave to make the vote. As they gather round to cast their votes, we hear their inner thoughts and one thing becomes clear: none of them want the job. It’s a huge job, and a tremendous responsibility and as most are elderly and comfortable with their routines in their respective parts of the world, not many are eager to find their life uprooted. The first round of votes seem to point to Gregoire (who the media believes is the frontrunner) getting elected but in a final vote, the tide shifts totally and to the unknown Melville. He is rightly stunned. As his colleagues surround him, he officially accepts the position. Officials hurry to present him to the crowd and just as the moment arrives, the new Pope exclaims in anguish and runs back into the nooks and crannies of the Vatican. Unable not only to face the throng waiting to see their new Pontiff, Melville himself is unconvinced that God has given him the tools and faculties he needs to do the job. He’s simply not ready. Panic-stricken, he flees the Vatican to wander the streets of Rome, where he meets shop-girls, bakers, cafe workers and a band of Chekhov-spouting actors. But desperate times call for desperate measures and a psychoanalyst (Played by Moretti, taking a role in his own film) is brought into the Vatican to try and counsel the reluctant pontiff. The key word here is try. Unfortunately, he can’t be left alone with the Pope to truly talk out their problems. Psychology is seen as being counter to the teachings of the church (a subconscious and a soul can’t coexist, it seems) and it doesn’t matter anyway as he is constantly surrounded by the other cardinals, their first and only meeting is superficial and not very helpful. Asking why he was even bothered to be called up, he is simply told that he was considered “the best” in his field. So, what do they do? They seek out the second best, who just happens to be Moretti’s wife. Back at the Vatican, the Pope’s runaway is kept secret. Charged with damage control is the Vatican’s PR maven (Jerzy Stuhr). He arranges for a Swiss Guard (Gianluca Gobbi) to occupy the Pope’s room and open and close the curtains as if he were there. As the Pope still hasn’t been seen by the public and due to the sensitive nature of what is going on, Moretti is remanded to the Vatican grounds to hang with the cardinals until everything is sorted out. Then, in secret, the Pope is taken into town to see the second best psychoanalyst. This session is much more successful mostly because the Pope can talk a bit more freely (but still can’t reveal who he is). But getting what he can off his chest does wonders and he leave the analyst’s office, decides to take a brief walk and uses the opportunity to shake the security detail on him and escape into the streets. Some of the film’s more humorous moments come from the absurdity of the charade staged to convince the cardinals, and everyone else, that the Pope is recovering in his apartments, saying his prayers, and empty trays of food are brought forth to prove that his appetite is vigorous. Meanwhile, the cloistered psychoanalyst draws closer to the cardinals, playing cards with them, discussing faith and eventually, he forms teams and organizes a volleyball tournament under the guise that the Pope could use the show of strength from his cardinals (though one suspects that boredom is quickly settling in for the civilian doctor, who would like to leave). And while all this is happening, the Pope is among the citizens who have no idea who he is, as he tries to work out if actually being the Pontiff is something he wants, or is capable of doing, and though unspoken, he wonders if turning to faith for his whole life has fulfilled him. Having disclosed his interest in the theatre (Melville studied acting but failed auditions), the Pope also tags along with a traveling troupe staying in his hotel and gets to show off some Chekhov dialogue. He even buys a box seat at a performance, but a gaggle of cardinals are also in attendance and complicate matters. 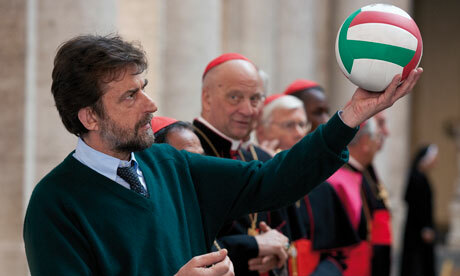 Probably the most controversial film screening at the 64th Cannes Film Festival, thanks to the usually virulent reaction that anything that is even remotely anti-religion tends to get these days, Habemus Papam is director Nanni Moretti‘s latest irony-laced film, which takes a stab at the institution of the Vatican. 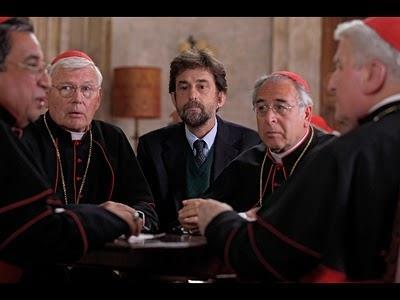 “ This isn’t new territory for Moretti, who follows up 1984′s religious satire The Mass is Ended, with this look at the Vatican’s attempt to elect a new Pope, which remarkably is also the Italian director’s sixth film in Competition at Cannes over the years. Moretti’s premise is enticing, almost brilliant. One pope dies, and the conclave to elect his successor settles on Cardinal Melville, played with perfect mournful sensitivity by 85-year-old Michel Piccoli. Moretti pulls off a tremendous opening set-piece, in which the assembled cardinals cast their votes for one of their number, each and every one praying they don’t get the nod, aware of the crushing effect that the pontificate would have on their lives. It’s at the very moment when the cry of “habemus papam” – “we have a pope” – goes up that Melville’s self-doubt surges out of control; in a great howl of fear, he refuses to step out onto the balcony, and throws the papal selection process into limbo. We are all set for a King’s-Speech style encounter between a great man and his teacher, whose relationship will define the other and provide both with an emotional journey. But Moretti has his pope suddenly scoot off into the big city, there to wander through the quotidian realities in a long dark night of the soul, in which he must wrestle with his doubts alone. Analyst Moretti is left behind in the Vatican, there to play cards with the cardinals and arrange the aforementioned volleyball tournament. With the two men apart, the film starts to meander, hopping between scenes with no particular connection, and thereby losing much of its narrative focus. That’s not to say much of what remains isn’t valuable and funny. Moretti is a loose and entertaining presence as he tries to keep order in the cloisters, and Piccoli is always thoughtful and humane as his troubled soul pushes him from bakery to theatre to hotel. There’s something of Christ among the people about him, especially in one particularly moving scene when he rehearses his doubts aloud on a crowded bus. Moretti deserves respect for not simply taking a hatchet to the papal office; it’s an easy target in the aftermath of the abuse scandals and most directors would be unable to resist. HABEMUS PAPAM wants to emphasise the human consequences of a great religious office, and in that it succeeds. “Habemus Papam” ends with a speech, but it’s not the rousing, crowd-pleasing, tear-jerking, let’s-go-get-em stuff of “The King’s Speech.” Instead, it’s bracing, honest and even a little shocking and it ends the film on a question, but not for the audience. The question is pointed directly at the church that more or less asks if total devotion to God is worth abandoning other more Earthly passions for and if so, if that trade-off is even right or fair. The keystroke to the success of Moretti’s film is that the thematic push-and-pull rides under the surface of what is a very often funny film. The laughs are frequent, but never mean. Moretti isn’t interested in condemning the church, or judging the choices of his characters in the past, but only asks if now, those decisions were fruitful. “Habemus Papam” succeeds where “The King’s Speech” didn’t, because the stakes are much more personal and real, and when the film ends, Moretti realizes that one speech is only just the beginning of a life unraveled that is slowly coming back together.